I picked up this book and couldn’t put it down, not because the plot is suspenseful (it’s not) or the pace exhilarating (it isn’t), but because when you find something clear and cool and lovely to drink, it’s hard to stop once you start. That mention of Feuerbach and joy reminded me of something I saw early one morning a few years ago, as I was walking up to the church. There was a young couple strolling along half a block ahead of me. The sun had come up brilliantly after a heavy rain, and the trees were glistening and very wet. On some impulse, plain exuberance, I suppose, the fellow jumped up and caught hold of a branch, and a storm of luminous water came pouring down on the two of them, and they laughed and took off running, the girl sweeping water off her dress as if she were a little bit disgusted, but she wasn’t. It was a beautiful thing to see, like something from a myth. I don’t know why I thought of that now, except perhaps because it is easy to believe in such moments that water was made primarily for blessing, and only secondarily for growing vegetables or doing the wash. I wish I had paid more attention to it. My list of regrets may seem unusual, but who can know that they are, really. This is an interesting planet. It deserves all the attention you can give it. Those last two sentences. Wow. I’d never have believed I’d see a wife of mine doting on a child of mine. It still amazes me every time I think of it. I’m writing this in part to tell you that if you ever wonder what you’ve done in your life, and everyone does wonder sooner or later, you have been God’s grace to me, a miracle, something more than a miracle. You may not remember me very well at all, and it may seem to you to be no great thing to have been the good child of an old man in a shabby little town you will no doubt leave behind. If only I had the words to tell you. 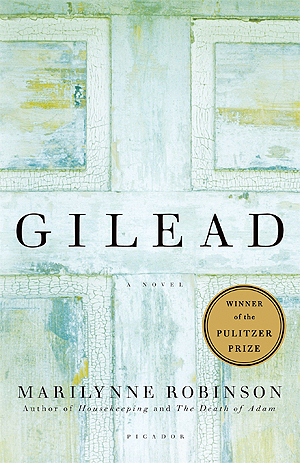 If you read no other fiction this year, please pick up Gilead. But only if you want an illuminating, expansive view of the the lives we live and the world in which we live them. And an honest, unflinching look at faith’s limitations and potential. And gorgeous prose that gives voice to the workings of your innermost sacred heart. And truth and beauty and wisdom. And…well, you get the point. Five stars for this one. Yesterday, my sixteen year-old daughter announced that she was giving up carbs. “Because,” she said, “I’m too dependant on tortilla strips.” That’s strips, not chips–as in the five pound bag of Tortilla Strips from Costco that she plows through every day and a half. I was impressed, and surprised. Three weeks doesn’t sound like much to some people, but this is my girl who was born with a bag of white flour in one hand and a bag of white sugar in the other. And now she was giving up both? I could see her logic, but wasn’t sure she understood the full implications of a tortilla-strip-free existence. It could get dire. I decided to help her out. “Okay! And if it’s a challenge, we’ll need a prize. Let’s see, what should it be…” I could have mouthed along with her what came next. We agreed that we wouldn’t go crazy and read labels to avoid anything with a few carbs or grams of sugar in it, but rather that Meg would avoid basic carb items like bread and chips (strips) and I would avoid table sugar and desserts. “If we both win…”–the pause was short–”then Dad has to pay for us both to get our nails done–pedicures too!” I called Derrick and told him about our pact and all he said was, “It doesn’t sound like a very good deal for me.” (He forgot that nobody asked for his opinion.) And just like that, it was Game On. We sailed through the next eight hours–no carbs! no sugar!–then sat down to a healthy dinner of grilled chicken and veggies to end Day One of the New Healthy Us. After we finished, Meg asked if there was any more chicken left. “Shoot, there’s not. Did you not get enough to eat? We could make more.” With her newfound discipline, I needed to be sure the little health nut was eating enough. She waved her fork and shook her head. “Nah, it’s okay. I’m gonna have some ice cream later.” I stared at her. 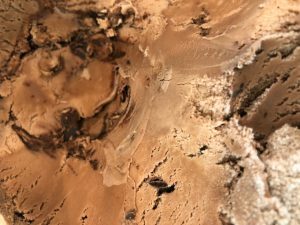 “We have Mudslide in the freezer.” She shrugged and looked at me quizzically. What do you mean what do I mean? “No it’s not, it’s full of sugar. I never said I was giving up sugar–that’s what you’re giving up. So I can have ice cream…but you can’t.” She said this last part gently, but it was pure malice. She knew that Tillamook Mudslide was my favorite flavor, among all ice cream flavors, of all time anywhere in the history of ever. She knew that Tillamook Mudslide was the ice cream I craved and dreamt about and fought for. 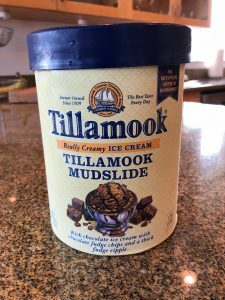 And she also knew that, after our first warm and sunny Saturday in ages, nothing sounded better at the end of it than a big fat bowl of Tillamook Mudslide. Eating it was practically why sunsets were invented. b) My daughter is much brighter than I thought she was, as evidenced by this cunning and crafty scheme to eat chocolate ice cream on her rigid “no carb” diet. My gut told me to go with b. And so we finished Day One of No Carbs/No Sugar/The New Healthy Us with Megan eating a large bowl of Tillamook Mudslide and me eating a whole wheat pita while I watched her. To be fair, I’d toasted my pita and sprinkled it with Splenda and Cinnamon, hoping to feed my sugar craving with a tricked-out version of “cinnamon toast.” Megan looked down at my pita and sighed. “You’re so lucky, you get to eat bread…(sigh)…I miss carbs.” She looked longingly out into the night sky–as if a carb was there dancing among the stars–and then dipped her spoon deep into her bowl, pulling up a massive scoop of ice cream and turning it over to eat upside down, slowly and thoughtfully. I gnawed on my Splenda-soaked pita. It didn’t taste like cinnamon toast. (In fact, it didn’t taste at all.) Megan finished her ice cream and gave me a hug before she went to bed. I did it Mom! A disciplined day with no carbs. What a champ. “Of course I’m gonna eat it. It’s not a carb.” She looked at me and smiled. 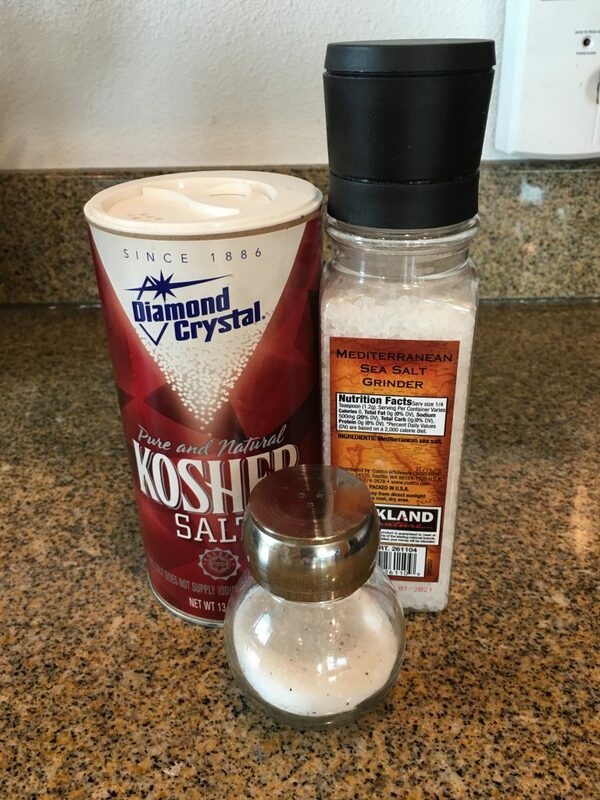 I can no longer taste the salt on my food. I guess it was inevitable. Because: Denny’s. When I was twelve, my parents took us to Disneyland. We spent a week in California and ate every meal–and I mean every meal–at Denny’s. Why wouldn’t we? It sat on every corner, served breakfast all day, and had those wicked circular booths that seated all six of us. Plus, thanks to the twenty-seven page spiral bound menu, everyone could find a full color photo of exactly what they wanted and then order exactly what they wanted because, curiously, everything was about the same price. (How could an 8-ounce steak cost the same as french toast? I don’t know, but they were both $6.99.) Ah, Denny’s. It still looms large in our family lore. 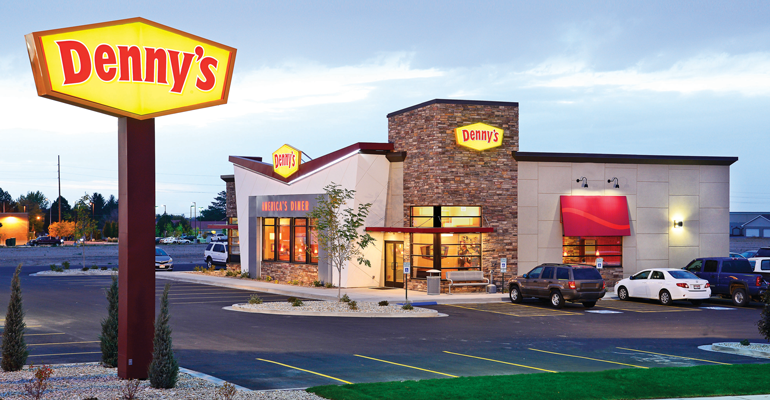 But more than the booths or the breakfasts or the whiff of tobacco drifting over from the Smoking Section, what I remember most about Denny’s is the constant, conspicuous consumption of salt by the elderly. See, on our Denny’s-masked-as-Disneyland Trip, we always ate dinner at four-thirty or five ‘o clock in the afternoon. My parents swore this was because “you kids” were hungry by then, but “we kids” knew it was really because of the Early Bird Special. When you’re paying for four kids to eat three times a day, Buy-One-Get-One-Half-Off warrants moving dinnertime up a few. And so there we sat on another warm vacay day, sunburned and mopheaded with corduroy shorts pulled over our homesewn swimsuits, flipping through the glossy food catalogue when we heard something amiss. We looked around for the source of the gentle rat-a-tat; we could hear it only if we stayed silent and strained our ears. After several moments my sister elbowed me (hard! geez!) and nodded toward the table beside us. I subtly (immediately) turned and looked, but all I saw was an elderly man shaking salt on his hash browns. I raised my eyebrows at her. (What?) She then nodded toward the table on the other side of us. I looked at saw an elderly woman shaking salt on her patty melt. I then looked around at all of tables in the greater Non-Smoking Section and soon realized that behind us, in front of us, to the side of us–the rat-a-tat was no more than The Elderly shaking their salt. Now I do not mean to disrespect The Elderly. I love The Elderly. I happen to come from a long line of elderly people, and hats-off to them for sticking around long enough to give me some disarmingly good-looking genetics. Some of my heroes are elderly–writers, church leaders, the Golden Girls–and they don’t seem so bad either. My parents now qualify as elderly (although somebody needs to tell my mother this) and, despite my earlier projections, they still seem have occasional thoughts and feelings. Nobody loves The Elderly like I do. But I cannot ignore their salt intake. We all know that as we age our tastebuds dull, and the first thing to go is our tongue’s recognition of salt. This is why the Elderly People at Denny’s were pouring so much salt on their food; they had a hard time tasting it. I didn’t judge them then and I don’t judge them now; everybody’s salt biz is their own. But what does concern me is that, as of a month ago, I can no longer taste the salt on my food. Like, for real. But here’s the thing: if we’ve invented Botox to replace Time, then surely we can come up with something to replace salt. Mrs. Dash? Ranch packets? Soy sauce? Wait, that’s just liquid salt. Can I still taste liquid salt? Because If so, there’s nothing keeping me from trekking on down to the Dead Sea. I’ve heard there’s a pocket of it called Don Juan’s Pond that is 44% saline and the “saltiest place on earth.” I may just swing by with a pot and some pasta and boil up something my bland little tongue can finally savor. If it zings to satisfaction–if I can, at long last, gratefully taste that salt–I’ll pour it by the poundfuls into sodium-tight barrels and bring it back to the states, throw in a few dehydrated peas and carrots, and market it as Cup ‘O Noodles for The Elderly.